This is a scenario-based practical knowledge evaluation. You will be guided through eight dimensions of Contract Management and you will be asked nine multiple choice questions for each dimension. This is a timed assessment and at 60 minutes the assessment will close. The question set is based on technical skills standards and there are varying levels of difficulty in the question set however, they are not designed to ‘trip up’ or trick you but rather to provide an insight into your expertise across procurement. On completion you will receive an individual report with an assessment of your capability across the dimensions of commercial contract management competencies. 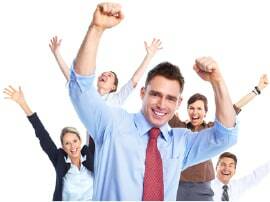 The report will highlight each dimension focusing on your strengths and your evolving skill-sets. The key output is a set of recommendations for you to consider in light of the case-study scenario evaluation completed. As you work through the assessment you may find themes that are not directly relevant to your current role. 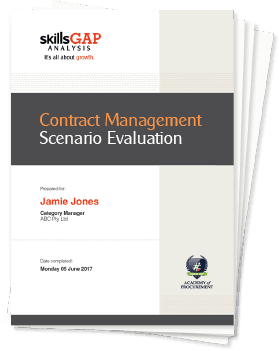 This is likely to happen for many people as this diagnostic considers a broad range of Contract Management capabilities. It has purposefully been designed not to be role specific, instead it seeks to explore the themes that a Contract Manager may experience in their day-to-day dealings. From your first kick-off session through to measuring and managing performance, a range of ‘on the job’ themes are explored.